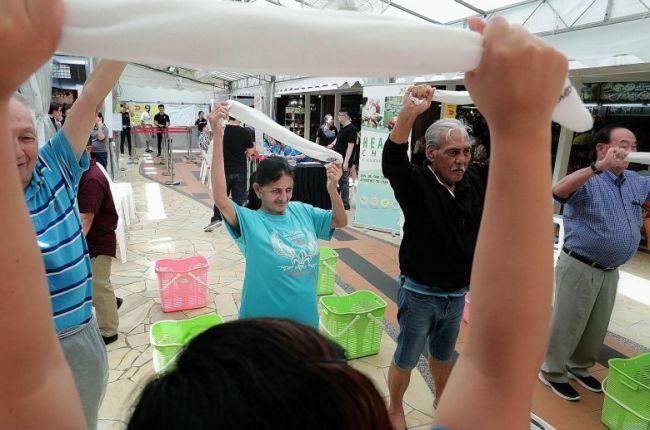 Older workers at 15 hawker centres, including hawkers, cleaners and shopkeepers, will enjoy free health checks and health coaching at their workplaces as part of an expanded programme launched by the Health Promotion Board (HPB) on Wednesday. Health Chats @ Hawker Centres, which was piloted in five hawker centres last year, will be rolled out to another 10 by March 2020. The programme consists of monthly 15-minute, health-check and coaching sessions over six months. Workers can join the session each month when they have free time during the work day, between 10am to 5pm. The HPB's health coaches will measure their body mass index (BMI) and blood pressure. The coaching covers both health and safety topics, including chronic disease prevention and management, ergonomic lifting techniques and low-impact exercises. Information booklets containing safety tips are also distributed to the workers. The programme was piloted at Tiong Bahru Market, Geylang Serai, ABC Brickworks, 85 Redhill Lane and Tekka Centre from last June. The workers there are still enjoying the service. The HPB said it is in talks with hawker associations to roll out the programme at 10 other hawker centres, including Chinatown Complex, Old Airport Road, Pasar 16 @ Bedok and Golden Mile Food Centre. In a statement, the HPB and the Workplace Safety and Health Council said: "Amid a greying workforce, the programme will provide hard-to-reach mature workers in the less structured food and beverage, retail and cleaning sectors convenient access to health checks, as well as health and safety coaching. "This is important as most of the mature workers in hawker centres - the hawkers, market shop retailers and cleaners - tend to have limited access to health and safety programmes due to their unstructured work patterns, long shift hours and short rest breaks." The pilot programme benefited more than 2,900 workers. According to the HPB, about three-quarters of those who had body pain said they experienced a reduction in pain and 80 per cent had adopted healthier habits such as eating more vegetables and cutting back on sugary drinks. About 20 per cent increased their physical activity, while 30 per cent of the overweight participants saw an improvement in their BMI. On Wednesday, Senior Minister of State for Health Amy Khor, Minister of State for Manpower Zaqy Mohamad and Tanjong Pagar GRC MP Melvin Yong were at Tekka Centre for the launch of the programme. They are part of the Tripartite Oversight Committee on Workplace Safety and Health.